Include first & last name and age at the time photo was taken. We'll send you a certificate with your name and score. 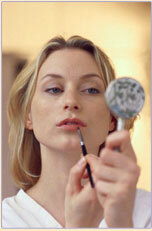 In some cases, we'll also send you tips on what you can do to improve your appearance. " A great appearance can open doors for you and make life more pleasant." Everyone has some degree of beauty, the trick is getting it out. A poor photo may result in a lower score. Get your looks placed on a scale of 1 - 10. Do you want to be a model, talent, movie star, or in the media business? You need to know what we look for in your appearance.